Everyone loves rocky road – dense chocolate bars filled with marshmallows, cherries and biscuit pieces. This recipe has a spooky edge with skeleton bones poking out of the chocolate bars. This recipe has actually been on the blog since 2012. Rocky Road is one of those recipes that is so quick and easy even a child could make it (with supervision of course). It’s a great recipe to have in your repertoire as it is a real crowd pleaser and can be adapted for all sorts of situations. I first decided to make rocky road at Halloween when I came across some Haribo marshmallow ghosts. I added these to the rocky road mix at the last minute so it look like the ghosts were emerging from a graveyard. Unfortunately they don’t seem to sell these any more but that hasn’t stopped me from making my Spooky Rocky Road this year. Wilton has come up with a couple of awesome candy melt moulds – from the bones of a skeleton to tomb stones, they have everything you need to make the added extras that will turn this rocky road from cutesy to spooky! You can buy them for just a couple of quid on Amazon so they won’t break the bank. The best thing about this recipe though is that if you don’t have the skeleton moulds, that’s not a problem. If you don’t like glacé cherries, that’s fine too. As long as you keep the molten mix of chocolate, butter and golden syrup the same you can really add anything you want. If those Haribo marshmallow ghosts come back they’d be perfect. In the meantime here’s my recipe for Spooky Rocky Road. 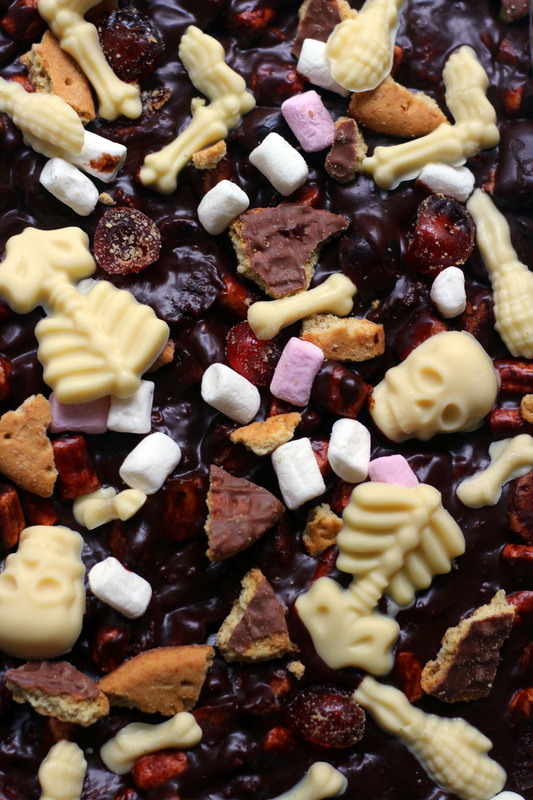 Rocky Road gets a horrible make over with this Halloween inspired recipe. Begin by melting the white chocolate in a glass bowl over a pan of hot water. Carefully spoon the white chocolate into the skeleton mould and place in the fridge to set. While the white chocolate is setting, cut the glace cherries in half and crush the digestive discuits before putting in a large mixing bowl with the mini marshmallows. Break the dark and milk chocolate into cubes and place in the glass bowl, again over a pan of hot water, along with the butter (cubed) and the golden syrup. Let the hot water melt the chocolate, butter and sugar until a thick glossy mixture has formed. Pour this over the digestive biscuits, cherries and marshmallows. Fold the mix until everything is fully combined. Line a 9 inch rectangular tin with grease proof paper and pour the rocky road mix into the tin. Place on the side and allow to cool for 10 -15 minutes until it is just soft and sticky to touch. Take the skeleton mould out of the fridge and begin assembling the skeleton bones on the top of the rocky road. Make sure they are pushed into the soft chocolate slightly. Place in the fridge for roughly an hour and a half to two hours or until the chocolate has set firm. Cut the rocky road into 8 large pieces of 16 smaller pieces before serving! What do you like to add to your Rocky Road? Let me know in the comments below. I know nuts are popular but I like to keep my Spooky Rocky Road child friendly so avoid any allergens. If you make these Spooky Rocky Road Bars please do send me a photo! You can tag me in as @EFWalt on Instagram or@KitchenGoddess3 on Twitter. Even better – why not post your photo to the Supper in the Suburbs Facebook Page?! Enjoy! Thanks so much! They taste as good as they look 😉 do share pics if you make them! OMG – this reminds me of one of those creepy photos where they’ve accidentally dug up a plague pit and you see all the bones in the soil. Only a cute edible version! Spot on for Halloween!! They are so cool aren’t they! Had to stop myself buying all of the creepy moulds they are so cheap and so effective. What a lovely idea Claire! We don’t get many trick or treaters in our area so often its just us snaffling the rocky road at a Halloween party 🙂 I love the idea of goody bags though. I love this idea and it makes such a good Halloween treat. This is a very popular choice at my baking parties and I love to add in Crunchie and Maltesers! Thanks Laura! What a great idea to add crunchies and maltesers. I LOVE honeycomb and you can never have too much crunch in a rocky road. What a fantastic idea! I love the skeleton chocolates! Thanks Diana! They look really cool don’t they!